Kenland Cottage provides a luxurious all inclusive self catering experience for the discerning tourist who wishes to have a carefree holiday in beautiful surroundings. With breathtaking sea views over the Minch to the Isle of Skye and the Outer Hebrides, it is the perfect destination in which to relax, unwind and escape the pressures of modern life. 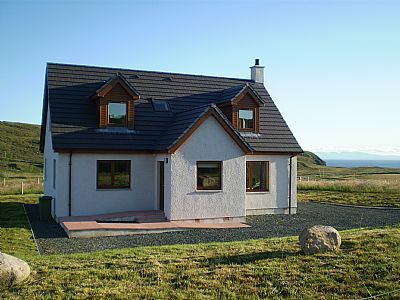 Spacious and well appointed the cottage comfortably sleeps six people plus baby (cot provided) in three ample double bedrooms all with their own individual ensuites. The family inspired open plan layout together with solid oak floors throughout gives a clean contemporary feel. Guests have the opportunity of countless walks from the front door of Kenland Cottage, whether it be a short stroll down to North Erradale beach where seals and otters can be seen, a stunning cliff top walk, or just exploring the local hills. The choice is yours! Porch - plenty of space for coats, rucksacks, boots etc. Hallway - leading to ground floor receptions, bedroom & staircase. Bookcase with Tourist Information and small library of books and DVDs. Kitchen - spacious, fully equipped, south facing with sea views. Solid oak fitted kitchen units with built in appliances to include Bosch touch control ceramic hob, Bosch electric oven, Bosch dishwasher, fridge freezer, washing machine, tumble dryer and microwave oven. Dinnerware and glassware for twelve place settings. Lounge - south facing triple aspect with outstanding sea views. Seating for six on three leather sofas. 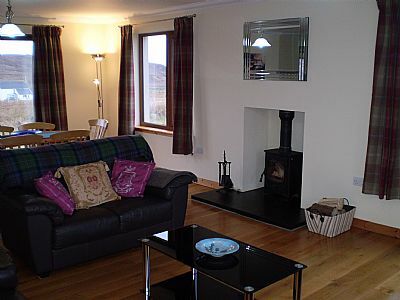 Woodburning stove, Panasonic 32inch LCD TV with satellite reception, DVD player, mini HiFi, storage heater. Dining area - south facing triple aspect with outstanding sea views. Dininig table and chairs to seat six, high chair for baby, storage heater. Patio window provides access to rear south facing garden. 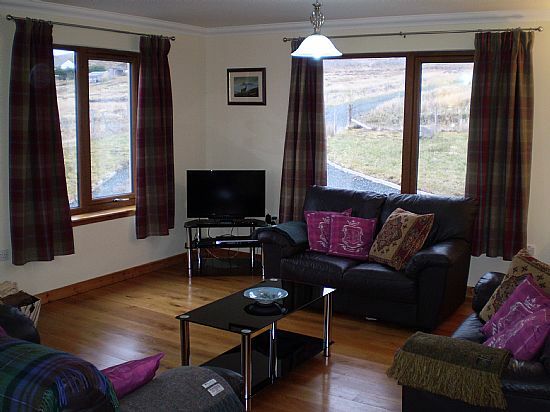 Bedroom - double bedroom with twin aspect providing fine views of surrounding hills. Equipped with double bedstead fitted with Silentnight Ortho Dream mattress, tub chair, bedside cabinets, chest of drawers, large built-in wardrobe, storage heater. Ensuite bathroom - complete with shower cubicle, bath, wash hand basin, toilet, storage heater and free standing towel rail. Master bedroom - double bedroom with triple aspect providing outstanding sea views. Equipped with double bedstead fitted with Silentnight Ortho Dream mattress, tub chair, bedside cabinets, chest of drawers, large wardrobe, storage heater. Ensuite - complete with shower cubicle, wash hand basin, toilet, storage heater and free standing towel rail. Bedroom - double bedroom with triple aspect providing sea views. Equipped with two single bedsteads, each fitted with Silentnight Ortho Dream mattress, tub chair, bedside cabinets, chest of drawers, large wardrobe, storage heater. Heating - all electricity costs together with a starter pack of fuel for the woodburning stove are included in the price of your stay. Heating and hot water is supplied by all electric total control heating. Towels & bed linen - towels, bed linen, tea towels and cleaning products are all included in the price of your stay. Baby facilities - both a cot and highchair are supplied, but please note we do not supply bed linen for the cot. Parking - ample private enclosed hardstanding for three cars. Plenty of space for bikes and kayaks. Garden - south facing enclosed laid to lawn with patio area and picnic bench from which to enjoy the fine sea views. Rotary washing line provided. Regret no smoking or pets.